Woodland Pattern Book Center was founded as a non-profit organization in Milwaukee, Wisconsin's Riverwest neighborhood by Anne Kingsbury and Karl Gartung in 1979. The name Woodland Pattern was chosen from a passage in Paul Metcalf's Apalache: South of Lake Superior, a culture center, the Woodland Pattern, with pottery but without agriculture... Thanks to the hard work and sustained effort of volunteers, Woodland Pattern became a nationally recognized cultural hub, and the staff (we are paid now!) is still working hard to uphold this vitality. 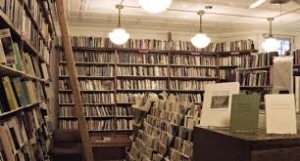 The center houses a bookstore with over 25,000 small press titles otherwise unavailable in our area. Because we are nonprofit, our inventory decisions aren't dictated entirely by commercialism. As booksellers and as presenters of art and literature, we want people to know that there is more than what you see at your chain book store, more than you are taught in school, more than what is reviewed in the papers. We hope to act as a catalyst, putting readers together with small press literature. Come browse our selection of poetry, chapbooks, fine print materials, broadsides, and multicultural literature. We think you'll be impressed! Our space also includes an art gallery where we present exhibitions, artist talks, readings, experimental films, concerts and writing workshops for adults and children.